Baroque Space Opera is now half edited. The setting material is undergoing a final look-through, but is now finalized. Editing is progressing on 62 locations and story hooks the book will contain, as well as the rules sections of the book. 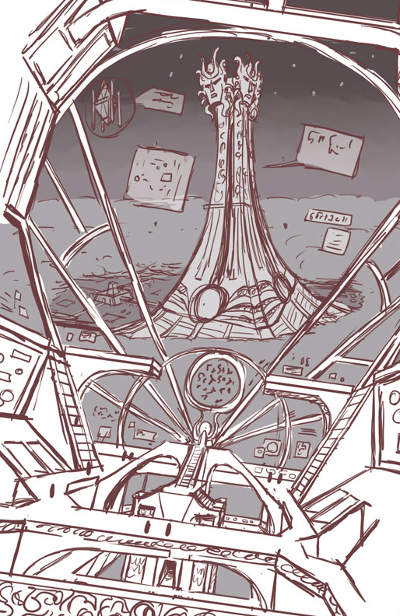 The locations have been seeded with story hooks for the GM and include a great variety of locations, from artificial megastructures to exotic planets to mysterious phenomena. Just so that the update is not entirely devoid of cool stuff, here is another art concept from Baroque. This is a view from the bridge of a Dominion battlecruiser, and if you look carefully, you will notice people on the bridge. Yes, it's that big! Everything in Baroque is larger than life, including voidships. The battlecruiser is approaching the planetary Heliocon, a 2km tall structure that serves both as the primary voidport of a planet, as well as the headquarters of the Body of the Tyrant: the religious body that reinforces the Tyrant's divine nature and which also serves as the bureaucracy of the Dominion. The Heliocon is topped by 4 solar masks resembling the one the Tyrant wears. They face the cardinal points and are unmissable on approach to the planet. The Heliocon is a symbol of the Tyrant's rule, and it reminds all about who it is that rules here. The Heliocon is surrounded by an energy field that keeps the clouds at bay, ensuring that the Heliocon is perpetually illuminated by the sun during the day and the stars by night. Each Dominated Planet hosts a Heliocon. High in orbit, above the Heliocon, orbits a haven: a Dominion space station. The final image is full colour, and looks amazing. You will have to wait to see it when the book is completed.